Psypoke - View topic - POKE FARM! I got PokeFarm two days after the last post, and now I'm a proud member of it! I have mine some week ago, thanks to torchie13125. Fgdfgd31, you were sent an e-mail with an 'Activate this account' button or whatever. You need to click that to activate your account. Yeah. Then I can click you back! And... I'm breeding Arakans if anyone wants one! If it's not taken by now, I'll have it for any of my final evos. Dude. It's uh, well, not ready yet. It's going to take me forever to get ONE and I missed two. And breeding list is full. 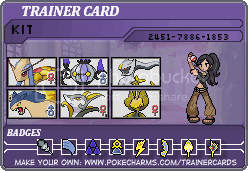 I have a Pokefarm too, thanks to torchie! I'm still Beginner rank and can't get events yet ;_;. I'm not pressuring all of you guys to trade good pokemon for junk, though . Maybe when I feel like giving up something good (more like if I even get a cool pokemon). Well, I got my Arakans when I was a rookie, so it'll be okay. Anyway, anyone for Flying Pichu? There are still flying pichus left? I'll take it for a final evo of mine. Dude, I'm breeding them as soon as I get the breeding list for Arakans out of the way. I do have a Flying Raichu, after all. Well, I don't have much to offer now. You can ask for anything that I have that does not have a nickname, although it may take some time to evolve them. I'll give you an early bird Natu for it. Just PM me! I think this is spamming!